Courtyard by Marriott, Marriott International’s brand that pioneered the select service category, has announced it expects to further grow its European footprint of 63 hotels by almost 50 percent over the next two years. 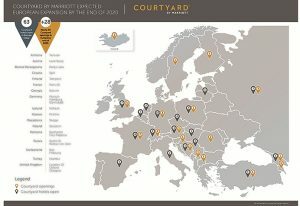 With nearly 30 hotels anticipated to open in Europe by the end of 2020, Courtyard will offer business travellers a continually elevated experience that meets the generational shift in how our guests work and travel today. Courtyard Paris Gare de Lyon – This hotel brings to life the brand’s new design vision for its properties and is ideally located in the city centre. The 19-story tower incorporates a contemporary look and feel and offers exceptional views of Paris and its iconic landmarks throughout its 249 guest rooms. The property is convenient to the Gare de Lyon station, a key travel hub and international gateway.